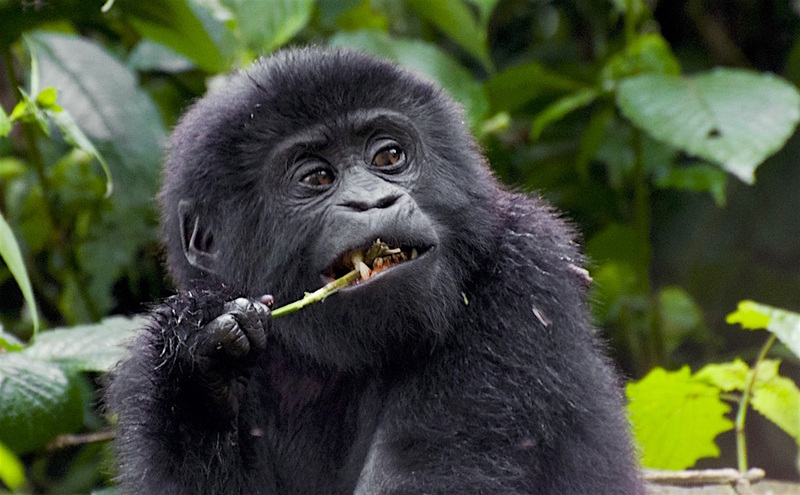 Mountain gorillas are herbivores, eating up to 140 different types of fruit, herbs, stems and roots. Like other primates they sometimes eat ants and termites and have been seen to enjoy a communal meal off a favourite rotting log. They are not users of tools; their main manipulation of vegetation is to avoid being stung. Most of their favoured food is found in the lush secondary growth of forest clearings and disturbed sites. 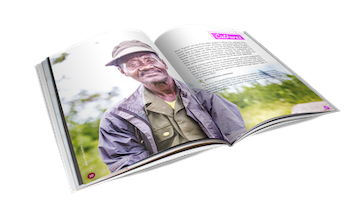 Their favourite food is ripe fruit, they will travel some distance for it and, in Bwindi, spend 10% of feeding time eating fruit. Otherwise, given that herbaceous plants are all around them, their movement from one site to another appears to be random. Their diet depends on altitude, habitat and seasonal cycles. They tend to be conservative, only eating what they know but refusing what gorillas elsewhere relish. However they can be trained to eat anything digestible in captivity, even meat. One district commissioner had a young gorilla that learnt how to catch mice, skin and eat them. Their powerful jaw muscles and long canines allow them to crush hard plants like bamboo. They have a single stomach and long intestine, like humans, and must eat a lot. An adult male consumes 20kg/44lb a day, which is why their stomachs are mostly bloated and they are renowned for their flatulence. They have a specialised digestive system, capable of detoxifying harmful compounds and have less need of plant medicines compared to chimpanzees and humans. Contact with farmers has led them to discover the succulent banana that grows freely by the forests. They don’t eat the fruit. The stem core is what they enjoy and this spells disaster for farmers who see their crops ruined. They have also developed a taste for eucalyptus but don’t cause as much damage. Since gorillas have been habituated, they don’t fear humans as much and have realised that they can get away with raiding. Some groups are active a lot closer to human settlements than before.